Read Simon Ortiz's essay "Homeland" and be prepared to discuss the meaning of the phrase "national sacrifice area." Background reading: Our Homeland, A National Sacrifice Area. Pages 337-365 In: Ortiz, S. J. (1992). Woven Stone. University of Arizona Press. Tucson, AZ. We will move our class map off of Google Maps and onto Google Earth to take advantage of the additional tools that are available using Google Earth (its a GIS platform). One difference between them is that you get to Google Maps using your browser (for example Google Chrome or Firefox) but Google Earth is itself a kind of browser that is separate from your usual internet browser. That's why you download Google Earth to your computer, like you do Chrome or Firefox. 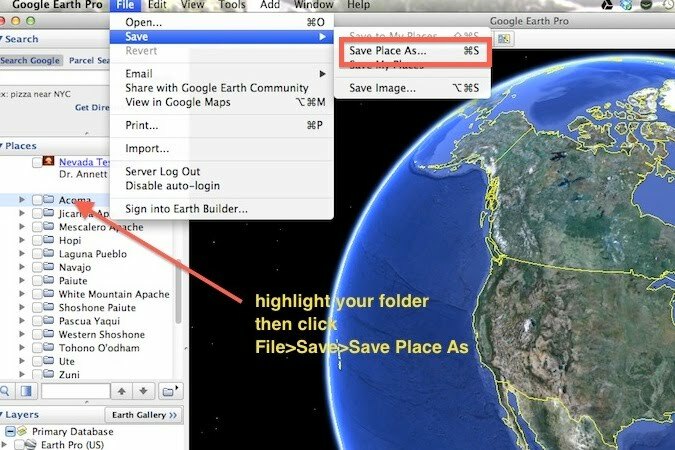 You can then use Google Earth to access imagery and files that are stored both on your computer (your map is saved on your computer) and online. The Google Map that we created last week has been downloaded from Google Maps as a KMZ file and attached to the bottom of this page. Each of the Tribes that you mapped last week has been placed in a separate folder, along with the environmental issues you identified. We have also included additional layers for your use. Download the KMZ file from the Attachment section on the bottom of this page to your computer desktop. Then launch Google Earth on your computer. Once Google Earth is running, click File>Open and choose the KMZ file from your desktop. In today's exercise you will focus on your folder and develop an overview of the Environmental Justice issues most important to the Tribe you have been researching. Add a written overview to the folder balloon and tell us whether this information supports the idea of the Southwest as a National Sacrifice Area. Feel free to copy layers or markers from other folders in the KMZ file, but make sure to put the copy in your folder so that all your materials are in one place (and give credit to the creator of the marker or layer). Tips: You open the marker icon balloons for editing by right clicking and choosing Properties (PC) or clicking the Command Key along with i (Mac). Use the time slider to explore historical imagery. You can set the view (altitude, angle, date of imagery) for each marker by highlighting the marker in the left sidebar, zooming to the desired view and clicking Edit>Snapshot View. When you are finished, save your folder and turn it in. You save by highlighting your folder and clicking File>Save>Save Place As (see below). Then put the file on our thumb drive. All of the folders will be reassembled into a single class map and embedded in this page.